Artificial intelligence, the internet of things, automation—these are all hot topics that will define the next couple of decades and the changes that will come. But automation is far from perfect, and when its processes fail, it can lead to a good laugh—or to some devastating losses. 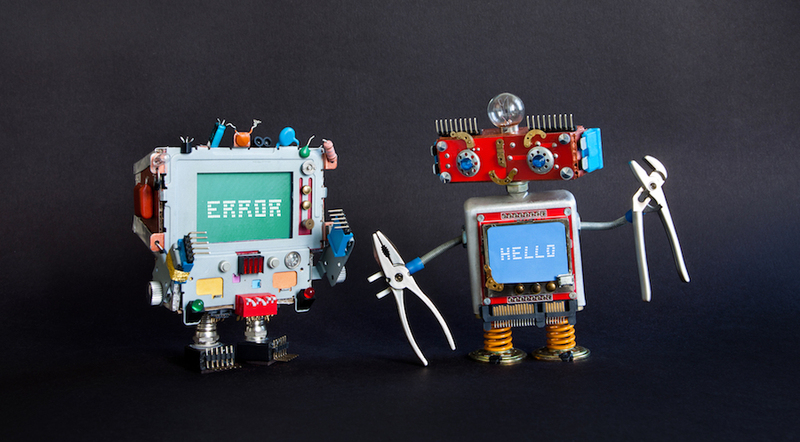 If you own a small business or are thinking about starting one, here are four important ideas to take to heart after re-evaluating the automation fails of 2017. Chatbots have been a hot topic in 2017, the “next big thing” that is “transforming the customer experience.” Companies across the globe have successfully used them to increase efficiency and productivity. But they’re not perfect. Earlier this year, Facebook had to scale back its chatbot initiatives after hitting a 70 percent failure rate. One of the strengths of a small business is that you can have a personal touch and a friendly feel, which is harder to achieve with larger corporations. While corporations can experience chatbot failures and still survive, smaller companies need to make sure they treat each customer with the respect and time they deserve. 86 percent of consumers say personalization plays a role in their purchasing decisions. It’s important for the small business owner to remember that personalization and automation get along just fine most of the time, but that one time when you send, “Hi First Name” to a big client, it can have terrible consequences. As you grow and expand, chatbots might begin to make more sense. But as a small business or fledgling company, don’t sacrifice the one thing that gives you a competitive edge: your personalized, human touch. Cybersecurity has always been an issue, as evidenced by the major data breaches that we’ve seen in 2017. But the introduction of AI and IoT have heightened the risks. For one thing, hackers have already begun to weaponize AI, automating the process of malware dissemination and data retrieval. As we saw with the Ransomware attack, companies will have to employ machine learning to combat these new techniques (in essence fighting fire with fire). Any company that uses the internet of things to any degree is also at a heightened risk of cybersecurity breaches. Simone Margaritelli of Zimperium hacked his own smart coffee-maker to test this out for himself. He found that anyone on the same network as him could take control of his device and put his data at risk—which applies to you as well. “In other words, if a hacker can take control of your caffeine dispenser, they can gain access to everything else it connects to,” Margaritelli said. That’s a frightening thought, given the projection that by 2020 there will be more than 50 billion things connected to the internet. Although the media likes to focus on larger companies getting hacked, the reality is that small businesses are the target most of the time and are in fact the more vulnerable target. 60 percent of small businesses that suffer a cyber attack go out of business within six months. Entrepreneurs have to account for this risk from the beginning if they want to be successful, whether they’re using automation tools or not. Young companies are often short-handed and it’s natural to want to take shortcuts when possible. But it’s best to remember that even though automation is convenient, convenience often has a price. Adidas learned this the hard way in April after sending out a well-meaning automated tweet after the Boston Marathon. Try to limit the autonomy of automation by always having a human oversee and approve things. Having someone approve social automation, reports, and orders can help you avoid poorly timed tweets, accidentally having Alexa order thousands of dollhouses for your company, and countless other automation mistakes. Starting a business is exciting. You have a blank slate to work with, but you also need a plan. Cisco released a report earlier this year that nearly three-fourths of IoT projects are failing. They also looked at the top reasons for failure: lack of collaboration, lack of resources, and lack of relevant IT skills. As you form your business plan, set out your budget, and make hiring choices for your small company, think about how you will successfully integrate technology in a way that will produce the greatest profits and reduce the chance of things falling apart. Take a Lean Planning approach to your tech integrations: run a series of smaller tests to verify that your solution works the way you intend before you do a full-scale launch. There is absolutely no doubt that we will continue to see automation fails in abundance, whether they’re funny or offensive, harmless or crippling. However, with these four lessons learned, you can avoid major mistakes as you lead your small business to success. Alec Sears is a small-business expert who loves to write about the latest trends in PR, marketing, and SEO. He now lives in the Silicon Slopes of Utah, where he loves trail-running with his dog and snowboarding with his wife.